Conveniently located near the main highway. Cheap stay for a short stopover on a long journey. The breakfast was good with quite a lot of choice. Good value for money. We just had a one night stay.hotel was comfortable and located close to city center. Für eine Nacht o.k., z. B. zur Pause bei langen Fahrten. 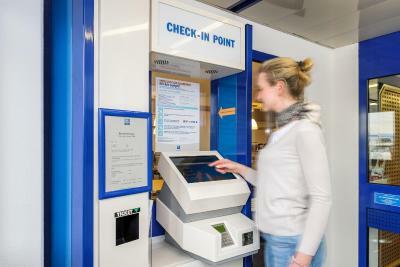 Check-in Automat ist jederzeit nutzbar und somit ist man unabhängig von den Rezeptionszeiten (nicht immer besetzt) undder eigenen Ankunftszeit. Ausreichend Parkplätze vorhanden. Ruhige Lage im Gewerbegebiet. Bahnstation zur Fahrt nach Augsburg mit der Bahn in der Nähe (nur 2 Stationen, ca. 15 Minuten). Zimmer war sauber. Alles vorhanden, was man für eine Nacht braucht. Zugang zumHotel und Zimmer mit persönlichen Zugangscode. Wir brauchten das Zimmer nur für eine Nacht und bekamen ein helles, freundlich eingerichtetes, sauberes und ruhiges Zimmer in der ersten Etage. Über die Dusche im Zimmer waren wir zuerst leicht irritiert, aber es ließ sich wunderbar nutzen. Das Frühstück war vielfältig und gut. Ich hatte bei der Buchung online eine Frage gestellt, welche mir schnell und informativ beantwortet wurde. Sehr einfaches System, man braucht keinen Schlüssel sondern nur ein zahlen Code. 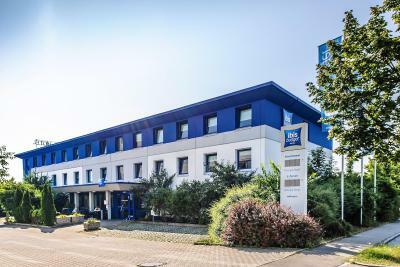 Ibis budget Augsburg Gersthofen is offering accommodations in Gersthofen. Free WiFi is available. The rooms in the hotel are equipped with a flat-screen TV. All guest rooms have a desk. 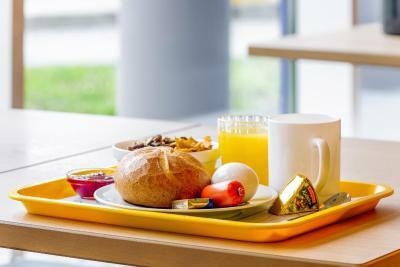 Guests at ibis budget Augsburg Gersthofen can enjoy a continental breakfast. Augsburg is 6 miles from the accommodation. The nearest airport is Munich Airport, 56 miles from the property. 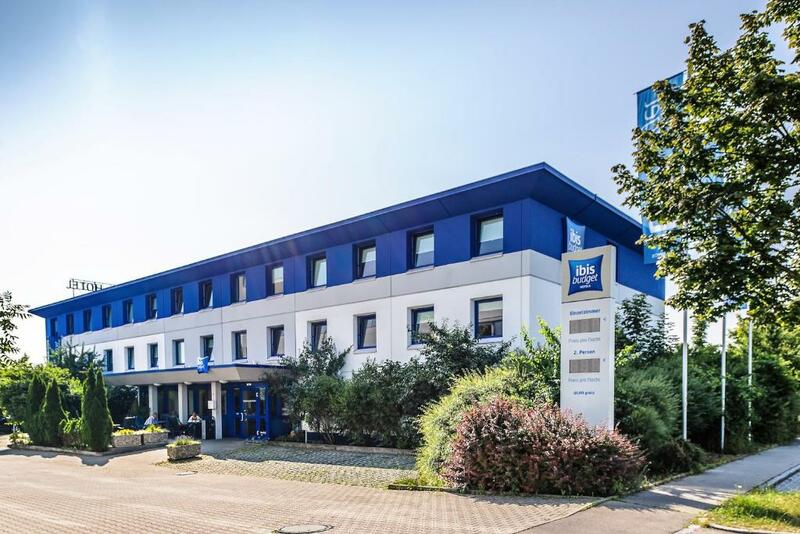 When would you like to stay at ibis budget Augsburg Gersthofen? 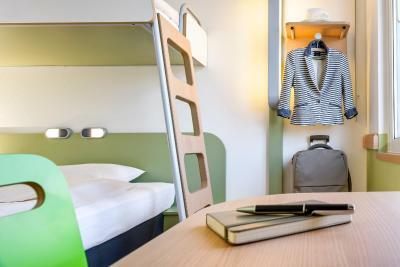 House Rules ibis budget Augsburg Gersthofen takes special requests – add in the next step! A EUR50 damage deposit is required on arrival (around USD56.04). This deposit will be fully refunded 7 days after check-out, as long as there isn't any damage to the property. ibis budget Augsburg Gersthofen accepts these cards and reserves the right to temporarily hold an amount prior to arrival. If you arrive outside reception opening hours, you can check in via the check-in machine for the 1st night. You can pay for the following nights or extensions of your stay by 11:00 the next morning at the reception desk. Guests expecting to arrive after 22:00 are kindly asked to call the property on the day of arrival to get further instructions for the check-in machine. In the event of problems an emergency call button is available in the entrance area. Please note that the children's breakfast must be paid for directly at the hotel. Additional supplements may apply depending on the age of the child. Where necessary, supplements must be paid at the hotel and these are not included in the total amount. Please check the rate terms and conditions. Special requests are subject to availability and may incur additional charges. Very poor location well away from town., only useful for overnight travellers. We were offered a room with two single beds that was supposed to fit 2 adults + one child up to 12 yrs old. The size of two beds put together was ok for us plus our 6 year old but there was no extra linens so we had to share two pillows and two blankets. The blanket in the bed was too small to cover 2 persons. Finding parking space can be difficult.you will have to pay 15euros for garage parking provided by the hotel.